George W. Truett was born on May 6, 1867, at Hayesville, Clay County, North Carolina. He was converted to Christ at the age of nineteen and surrendered his will to God for service. In 1890 he was ordained into the Gospel ministry. 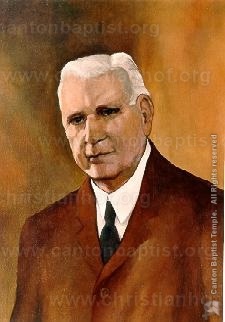 In 1897 he graduated from Baylor University and in September of that year was called to the pastorate of the First Baptist Church of Dallas, Texas, remaining there for forty-seven years. Under his leadership the First Baptist Church grew into the largest church in the world at the time. Dr. Truett served as president of the Southern Baptist Convention from 1927-1929 and as president of the Baptist World Alliance from 1934-1939. He was one of America’s greatest preachers. He always preached for a decision. He authored many books and maintained correspondence to the unsaved two mornings each week. Under his ministry there 18,124 additions to the church; 5,337 baptisms; 4,000 in Sunday School. He went to be with the Lord on July 7, 1944, at Dallas, Texas.